Our Turkey Formula is an all-American classic. A lean protein source that’s also low in fat and high in vitamins and minerals. 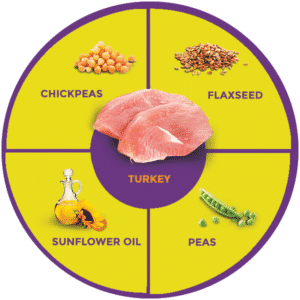 Turkey is rich in Riboflavin, which helps the body absorb nutrients in food, and Selenium, which is a powerful antioxidant. Our recipe is completely grain free so it’s perfect for dogs with food sensitivities and allergies. Our Turkey Formula is a great alternative to chicken, which can also cause allergies for some dogs. It also has a great taste that your dogs will love. Zignature® Turkey Formula – Learned from Nature, Crafted to Perfection.